COLUMBIA, Mo. – University of Missouri Chancellor Brady J. Deaton and Missouri Students Association President Eric Woods joined Dickerson Park Zoo officials on Wednesday, Aug. 24, to announce the naming of the zoo’s tiger habitat as the Mizzou Tiger Reserve. Mizzou Tigers for Tigers, the university’s mascot conservation program, dates to 1998 and is the first to be established in the nation. Student leaders at Mizzou recently sought to raise awareness on behalf of wild tiger preservation in tiger range countries by generating support for Missouri’s own zoo tigers. Both the number of tigers and the size of their habitats have declined 97 percent during the past century. Of the original nine subspecies of tigers, only six remain; current estimates note that between 3,000 and 8,000 wild tigers live in Asia where they are seriously endangered due to habitat destruction, poaching and the use of tiger bones in traditional medicine practices. 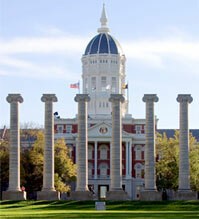 In addition to the Missouri Students Association (MSA), supporters include the MU College of Agriculture, Food and Natural Resources; University Bookstore; Mizzou Online; Intercollegiate Athletics; University Affairs and the Mizzou Alumni Association. Mizzou Tigers for Tigers seeks to become a national leader for tiger education, research on tiger ecology and biology, and in efforts to preserve the last remaining wild tigers. More information can be found at tigers.missouri.edu.